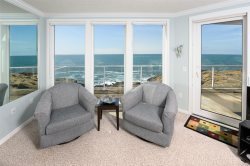 Take in the amazing oceanfront views of the crashing waves and pod of resident whales from your living room, master bedroom, and huge private patio with BBQ. All new furniture and décor provide for a truly luxurious vacation spot complete with wireless internet, BlueRay player, and I-pod dock. Whaler’s View boasts two master suites with incredibly comfortable king beds, perfect for two couples or a family of 4. Cozy up to the river-rock gas fireplace from the living room and the master bedroom, or cook a meal in the gourmet kitchen with beautiful granite counters and stainless steel appliances… not to mention a fantastic view of the ocean. When you are looking for the ultimate luxury getaway, where you can see the whales without going on a boat—Whaler’s View is for you. Blue Pacific is professional, courteous, and easy to use. They make vacationing more fun with no worries! We love staying at the property and plan on staying again whenever we come to Newport. We love staying here! The view cant be beat. They were absolutely amazing to work with. They were so accommodating and helped make our move from the perfect wave to whalers view go smoothly. They cleaned it early so we could get in early. They kept in contact with us during the move. It was great and I would definitely recommend them. In fact I already have! We really loved Whalers view. We stayed in this condo and also in the perfect wave. They were totally different from each other but Each was so special. This was a trip we will never forget and the condos were amazing. This has such a beautiful view of the rocky coast along with all the whales that you can see The condo is so beautiful and spacious and we enjoyed ourselves so much. If we come back to the coast again we will definitely be staying in one of these two condos and definitely be using Bluepacificvr! Blue Pacific vacation rentals is a great to do business with, easy to talk to and very helpful answered all our questions.